Many of them show a more than proficient knowledge of the Bible providing evidence that they are reading and studying their Bibles daily. Several of the inmates have expressed a desire to go into ministry after their release from prison. I am often asked to pray for those in my class and their families. 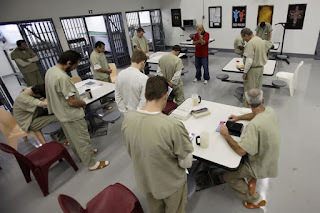 Yesterday a prisoner asked me to pray for revival to come to the Ney Unit, and he said he and other inmates are praying daily for this to happen. These men not only study their Bibles daily, but they also read other Christian literature made available to them by their library and by volunteer teachers. I have a new respect for prison inmates who have found Christ behind bars, and a new perspective on the evidence of "jailhouse conversions." The men I teach show evidence that Christ has made a huge and lasting change in their lives. I look forward to being with them each week, and I feel that time spent there is certainly not wasted.